Your cat's claws grow back after trimming. If you've ever been on the business end of your cat's claws, you know they're sharp. Regular trimming and scratching posts help keep them healthy. Don't worry about if you find nail fragments. Unless you declaw your cat -- it's actually partial toe amputation -- his nails will grow back. Healthy cats come equipped with five nail-topped toes on their front feet and four on their back feet. Polydactyl cats have extra toes and claws, and some have almost double the typical number. 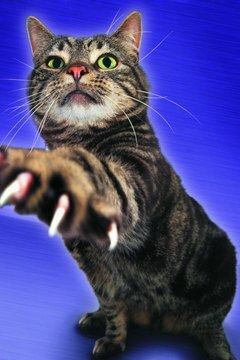 Cat claws are made of keratin and continue growing throughout a cat's life. If your cat has translucent nails -- some cats' are solid -- look for the pink color at their base. This is called the quick. It's where blood and nerves bundle. Your cat's nails continually grow, which is good because they're continually worn down from scratching, climbing, digging, self defense and holding prey. Some cats break or splinter nails during fights or feats of feline acrobatics. These nails grow back, too, but can sometimes lead to infection, particularly if bleeding is involved. Your cat's nails will only bleed if the quick is breached. You can stanch bleeding with silver nitrate or a styptic pencil. If those aren't available, try corn starch and flour. Keep an eye on the wound. If it looks like it's getting worse, call a veterinarian. Contrary to popular belief, cats don't scratch furniture to infuriate you or to sharpen their claws. Cats scratch to mark territory, stretch their muscles and to shed old claw sheaths. They also chew on their front claws to similar ends. It's hard to keep a level head when your cat rips into your favorite couch, but you should never discipline a cat beyond a simple "no." Give your cat appropriate scratching outlets like cardboard trays and scratching posts. Many different styles are available -- some cats like carpeted versions, roped versions, or plain old wood. Find the right scratching outlet for your cat through trial and error. Use treats or catnip to attract your cat to new scratching toys. Sometimes torn or broken nails start growing inward. This won't get better over time and can cause infections. It may be necessary to cut the nail to its base -- maybe even past the quick -- so call your veterinarian. Bacteria and fungal infections can be quite painful and also affect nail growth. 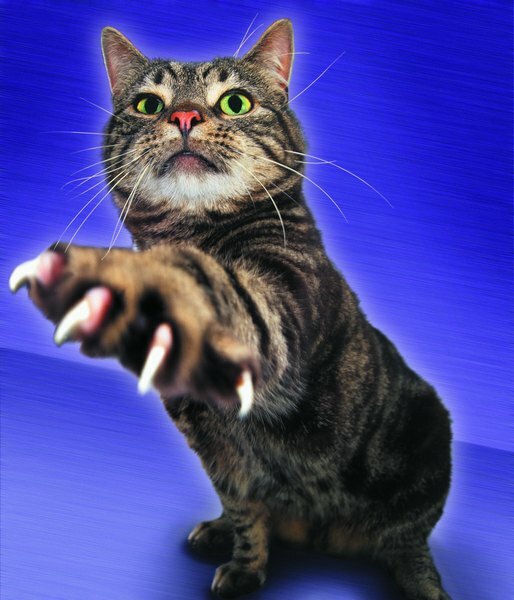 If you notice strange growths on or around your cat's claws, there could be an issue. Antibiotics or antifungal medications may be necessary. Call your veterinarian. A range of diseases and disorders can affect nail growth, too. If something looks suspicious -- here comes your cat nail problem mantra again -- call your veterinarian. There's one procedure guaranteed to stop your cat's claws from growing. It's called declawing, but it's actually partial toe amputation. This procedure -- banned in most of Europe and the rest of the world -- involves the removal of the last digit of your cat's toes. It's the equivalent of cutting off your fingertips or toes. Newer laser surgery methods still require the toe to be cut to the last knuckle. Toe amputation affects a cat's balance, his ability to defend himself, and can make everyday litter box use a major issue. Animal advocates including the American Society for the Prevention of Cruelty to Animals and The Human Society of the United States strongly oppose it. How Long Does It Take Parakeets' Wings to Grow Back After Clipping Them? Do Collars on Cats Make Them Lose Their Hair on the Backs of Their Necks?